“We can pat ourselves on the back about the past 223 years, but we cannot let the Constitution become an obstacle to the U.S.’s moving into the future with a sensible health care system, a globalized economy, an evolving sense of civil and political rights,” Stengel wrote. I wish I could write that I believe Stengel does not understand the difference between the notion of Natural Rights upon which our Constitution was founded and the notion of Human Rights to which he desires to change our system – but I can’t. The man does know the difference, and it turns everything he writes about our Constitution into a study on political deception. Human Rights are not the same as Natural Rights. The first is a natural enemy of the latter. The first point is this: the Constitution was written to protect the people from government tyranny. The founders were very clear about this. They stated that they expected our government to become what it has become, and that the Constitution was constructed in such a manner as to delay the inevitable for as long as possible. When they did so, they had men such as Stengel in mind. Therefore, it is not the people who protect the Constitution as Stengel claims, but the Constitution which protects the people from their government – exactly as the framers said. Which leads us to the next point: the spirit of liberty can be found only in our framers’ understanding of Natural Rights and Natural Law. It is not and will never be found in the system of Human Rights Stengel advocates. This point was never more clearly illustrated than in the difference between the Declaration of Independence and American Revolution and the Declaration of the Rights of Man and the French Revolution. It was the difference between these two understandings of liberty that prevented our founders from sending children to the guillotine, but not so much the French. The distinction here is important because the Constitution was designed to protect and preserve the liberty of a moral people. Again, this is not my opinion, but the clear assertion of the men who framed our Constitution. But we are no longer such a people. If we were, we would reject the claim that health care is a Natural Right. It is not. Nor does a globalized economic system have anything to do with protecting the Natural Rights of this nation’s citizens. In fact, the goals are actually at odds with one another: a free and self-governing people cannot remain so if bound by treaty to other nations whose government is founded on a system of Human Rights because Human Rights are based on human law and not Natural Law. They are natural enemies of one and other. This is clearly asserted by Stengel when he says we have an “evolving sense of civil and political rights.” What this man means is we are succumbing to those who wish to dominate and control, not to the preservation of individual rights and liberty. Our founders asserted that the Natural Rights of man are fixed, not “evolving.” Those who argue otherwise are betraying an ulterior motive. Though their words may sound as though they support individual rights and liberty, the truth is they are advocating slavery. Their deception lies in the fact that what they promise cannot be delivered without first forcing others to act against their will. Health care cannot be made a right unless others are forced to work to give it to you. That is the antithesis of liberty. Civil and political rights are equally deceptive terms. They mean special rights, which means preferential treatment by the government. This is a clear violation of the spirit of our own Constitution and of the American Revolution. Again, it is the antithesis of individual liberty, but it is the sibling of Communism, Fascism and every other corrupt form of dictatorship ever known to man. This brings us to the last point I wish to make about this story. If this man is confirmed, after he has clearly expressed a disdain for the Constitution, it will confirm that this disdain is shared by the members of the Senate who vote to confirm him. Our founders said that a system of oaths is essential to holding people to account. They said this system of oaths rested upon the sincere belief by the person taking the oath in a Creator and in judgment day. The founders said that, without such a system, we would eventually end up with people who do not think twice about lying when they take their oath of office, and that such people would eventually force the people to chose between slavery or fighting another revolution – this time against their own government. Dear reader, I submit that that moment is now at hand. Great post! This guy shows how successful the progressive indoctrination machine is working. Gramsci! 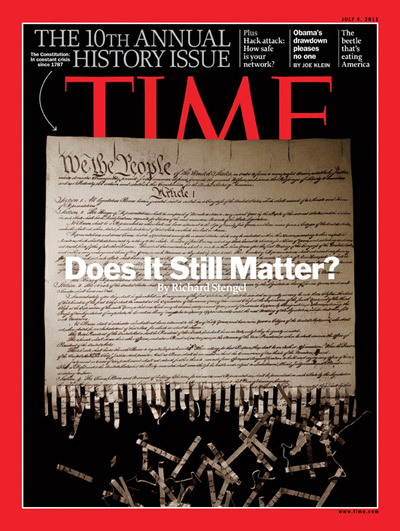 The Constitution may not matter to Stengel, but he may be surprised to find that it matters to a whole lot of us common folk, who will be seriously upset by those who overtly chose to ignore it. And that will be made to matter to him, like it or not.